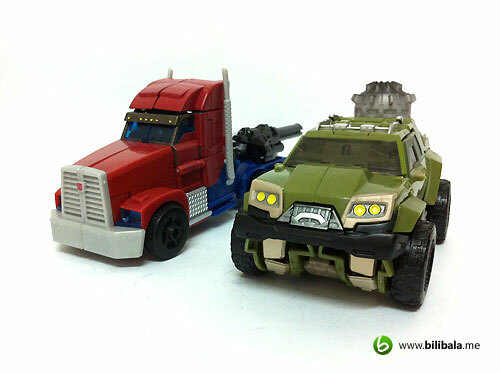 We already have the various colors of Autobots appear in the previous post. Now let’s us welcome another addition appear in Green, Mr. 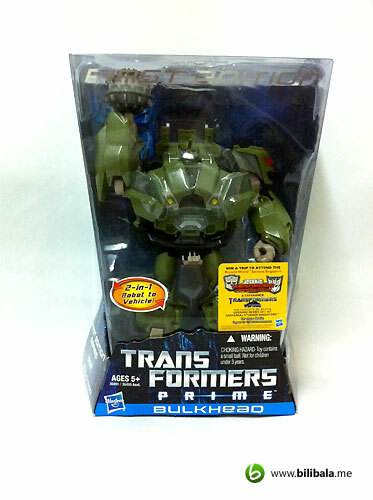 Bulky or better known as Bulkhead! 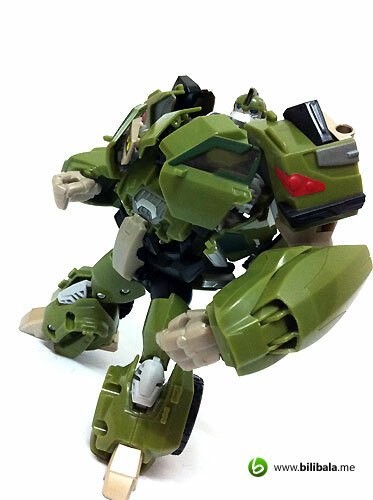 Without much surprises, Bulkhead is still as bulky as before and bearing the same color from the Transformer Animated series he has. Well, at least, he wasn’t as short and round as he used to be and he made a come back with taller and more muscular body built up. Read on! (A) What’s WITH the Package? 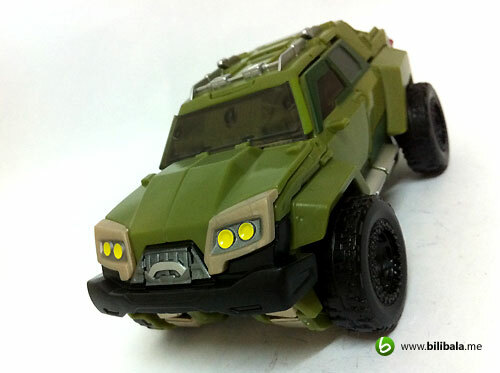 This is one of 2 new voyagers which came out in the 1st wave of Transformers Prime toys. 1st impression on the voyager with their packaging, Hasbro does invest a lot of buck in their new packaging especially the voyagers. Not only you get the whole new thick transparent plastic box, you also get a paper stand as well. One think i like about this new packaging is, they are really easy to reuse which mean you can take out and put back in your figure easily without much effort. 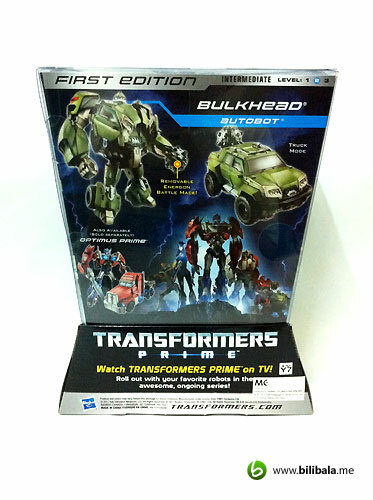 Pretty solid packaging in the meantime as compared to those paperback boxes appear in DOTM or ROTF voyagers. Now, the figure itself came in robot mode in the packaging and i took the liberty of changing it to the alt mode for the shot. 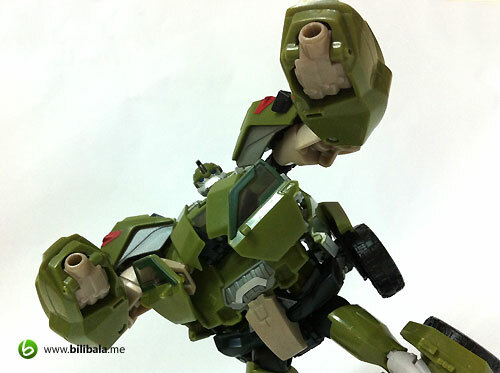 Like most Prime toys, you will to have the paper stand (generic type), the weapon and of course, the figure itself. 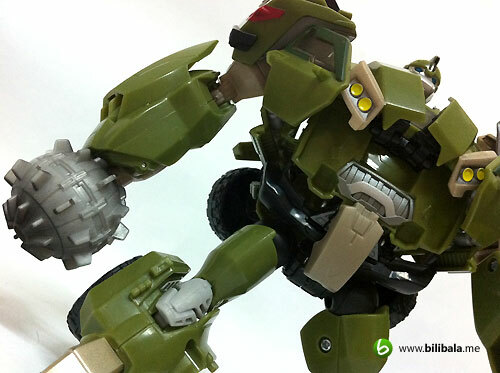 The new Bulkhead will have a Mace as his primary weapon which is similar to the animated version. 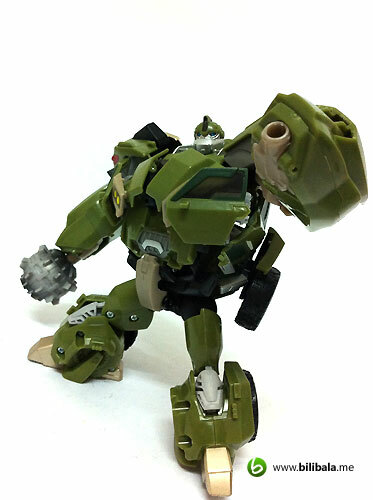 Remember the flying punching mace with string attached from the old Bulkhead? 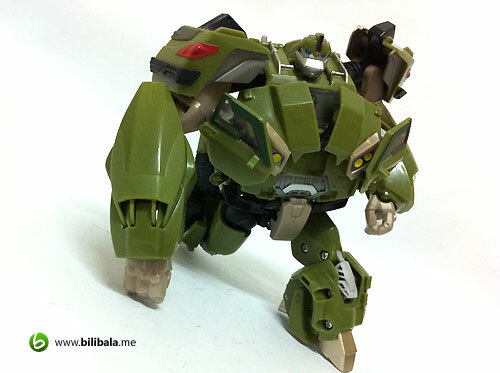 Well, the new Bulkhead will have a detached version of smokey painted one (and a lot spikier too!) . 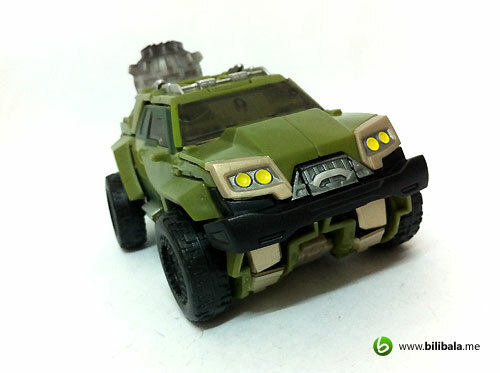 Let’s move on with the alt mode of Bulkhead. 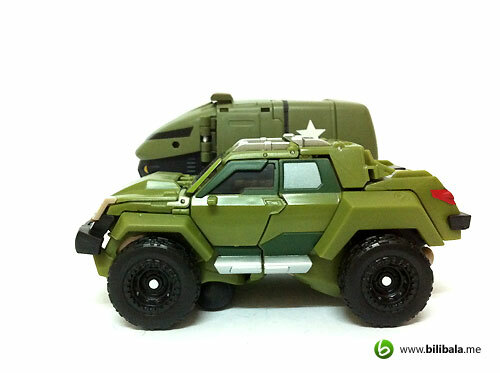 Is really amazing to think of the bulky robot can be very much smaller in his alt mode. And to adhere to the movie accuracy of it, the engineers behind Hasbro/Takara do spend a lot of effort getting this masterpiece up. 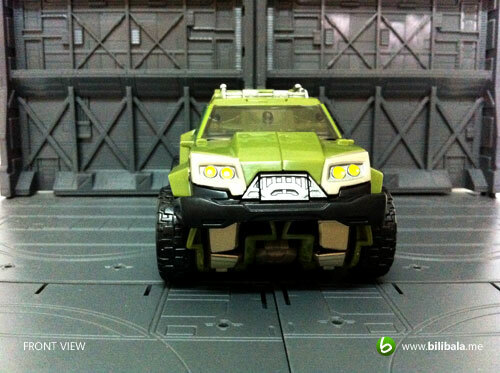 My 1st impression him, this is really a decent looking ATV which i am not very sure of it origins or make. 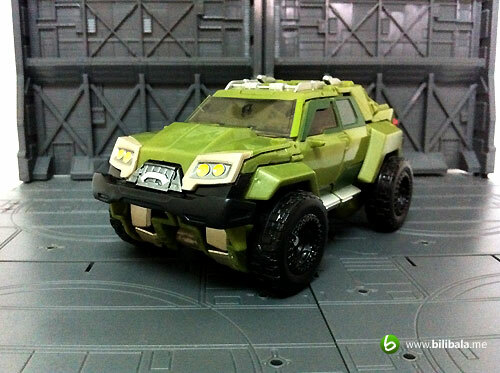 Really like the alt mode a lot. 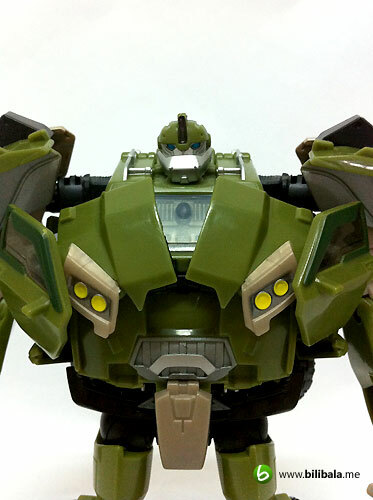 As for the plastic quality, as opposed to what the animated Bulkhead that i have, this new Bulkhead doesnt have a solid quality as what the previous has and parts of him really seem lighter. 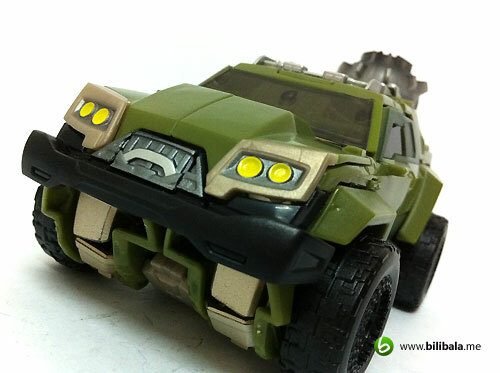 The overall color composition of him still remain green at large with additional darker shade of green (window frame) , yellow (for headlights), black (mostly for front and rear bumper, all tyres), metallic silver (top part of the car, front grill, side steps) and a metallic copper color for the front part. You will get to see the metallic silver painted front grill here. All windows are in transparent blackish window, except for the 2 smaller rear windows which are being painted of. 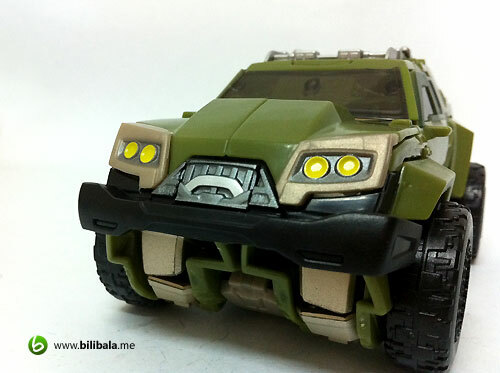 Front headlights are painted in yellow as well. The tyres are in hard plastic and you wont be seeing shiny metallic silver color treatment to the rims which is quite a bit of letdown. 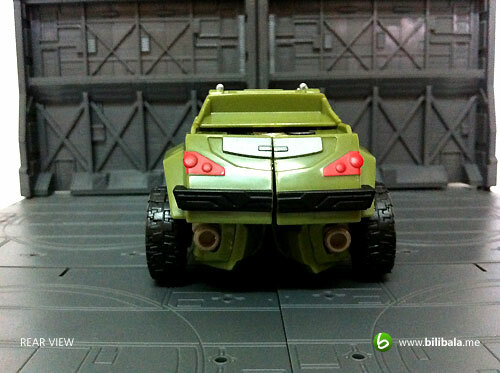 The rear light of the alt mode is being painted in red and you will notice 2 exhausts here. Sporty? oh yes. 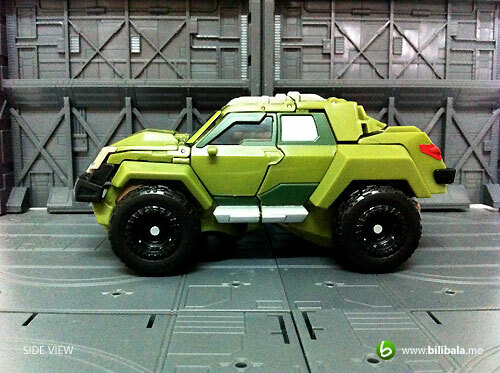 That’s what you have with this stylish ATV. 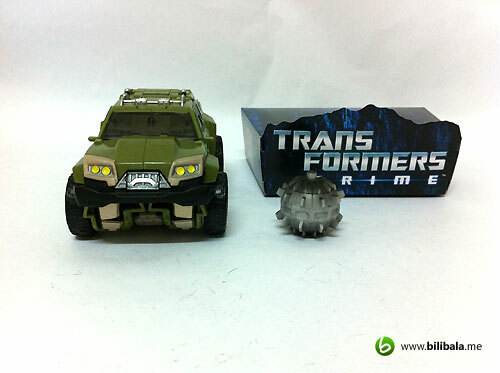 And actually these 2 “exhausts” are actually the hand cannons and the 5mm ports for the mace for the robot mode. 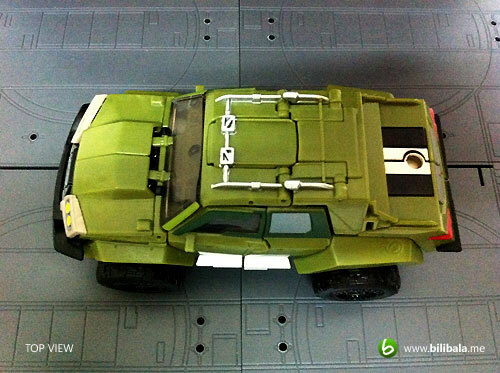 This is how the alt mode from top view. Notice the smaller details of the tops are being painted in silver metallic. You will eventually notice there’s a 5mm port here at the rear of the vehicle which you can plug in the mace here. This treats as a weapon storage. 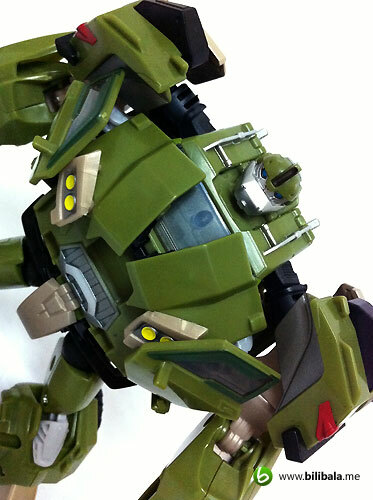 Now, what i really must say is, the robot mode of Bulkhead is massive and bulky (almost the size of 3 Arcee?) ! He does live up to his name. 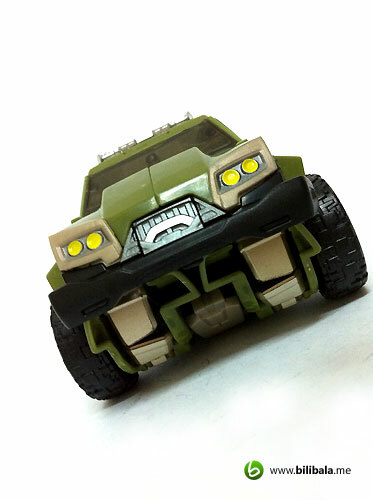 And again, it is quite amazing how this detail packed and bulky guy gets to fit into a smaller alt mode. 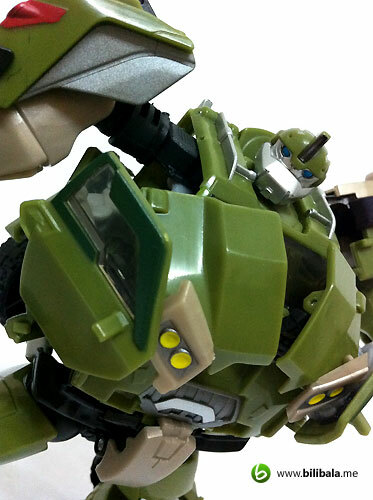 The different color composition makes the overall robot mode a interesting piece to stare with. You will also get to see quite a number of part/panels making up of the front chest. Pretty intrigue and that chest part is actually the front bonnet of the car. You might think this clumsy Mr. 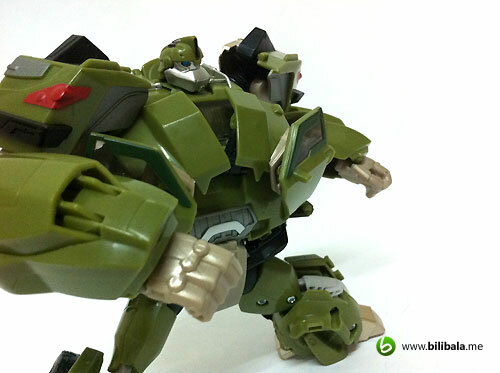 Bulky has a bad body to weight distribution. 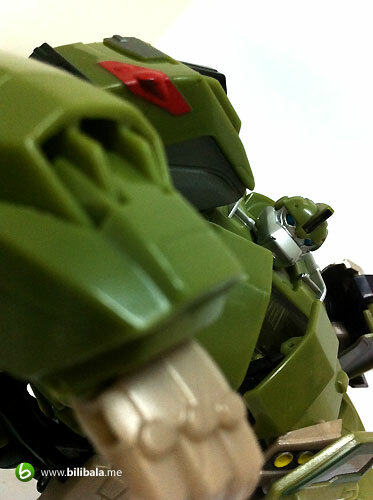 But in actual fact, he has very solid and steady balance which you can actually do quite some posing with him. 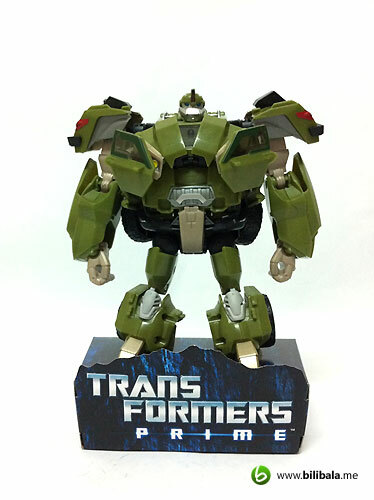 Speaking of the E-Honda of Transformer Prime that is! And speaking about articulation, he has standard articulation as other primes BUT, you will not see the waist articulation here. 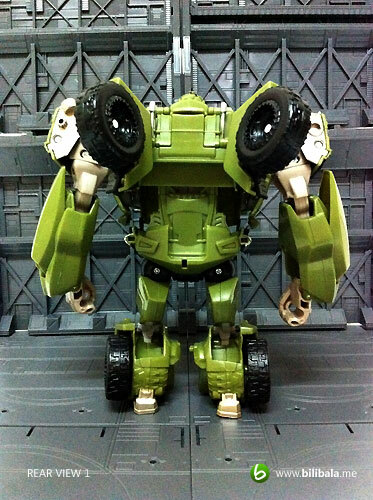 While the head remain to be in ball joint, you will have limited turning radius (which is around 25 degree left/right) and slightly up/down motion. 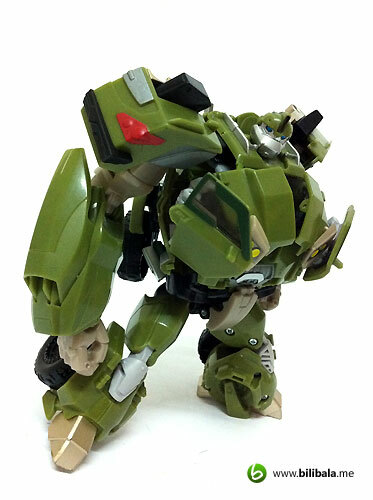 There’s another interesting point to note about Bulkhead here is you can have 2 choices of how to transform his back part of him. This is really mere personal preference of how you want it to be. 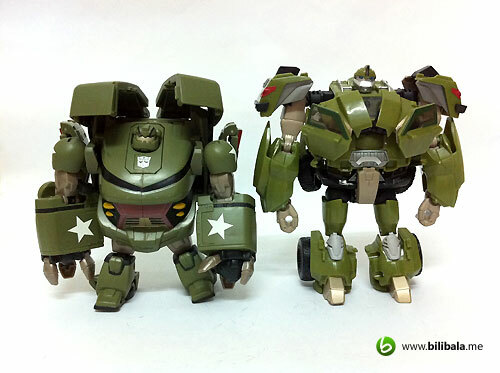 Here are the 2 possible transformation. The default transformation (which is being shown in the manual) . You will have the 2 wheels sticking up on his back. This is quite resembling the form he has in the tv series. Though you might have the backpack design, the weight of it doesn’t really pull down the body and doesn’t make it hard to stand. 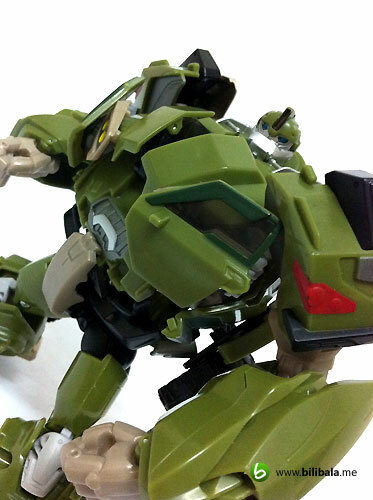 An additional point to note here, the arm piece which acted like a shield, is actually spring mechanised. Well, nothing much of a gimmick for it here and it is being so mainly due to the transformation sequence’s need. Another form of transformation. Instead of moving the wheel up, you can leave it down at the waist level. 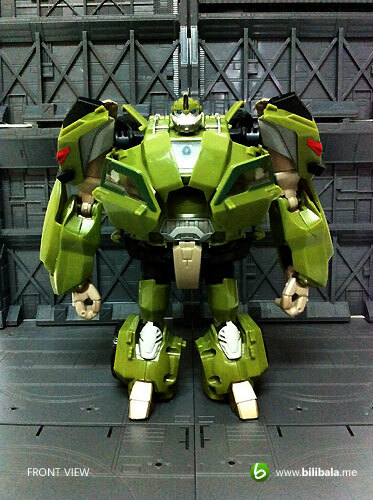 This will have a less “heavy” looking back part of Bulkhead. This, imho, is more eye pleasing and seeing the wheel section more streamlined with other parts (which you don’t see abruptly parts sticking out) . Now, let’s move on with the close up section of his chest + head part. He has no light piping for his eye (which is only made of blue painting to it). 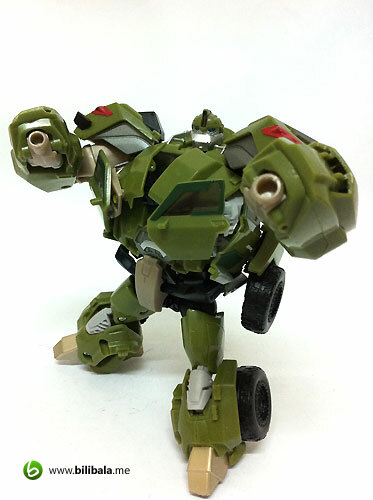 A note to point out here, you will NOT find the Autobot insignia for Bulkhead in both alt / robot mode which is quite a weird treatment. 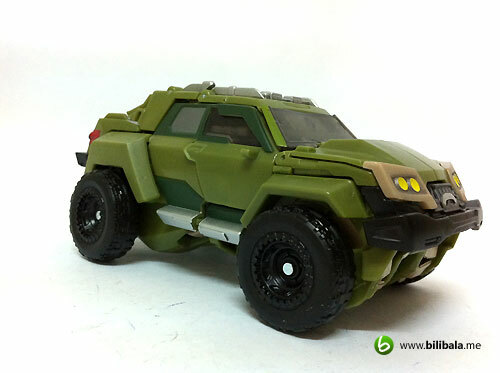 Did Hasbro forget to paint it on? Or he is trying to be discrete about which sides he is on? Figures. 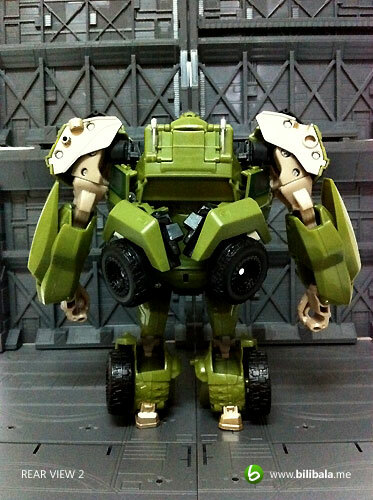 Transformation for Bulkhead is an amazing piece of engineering. 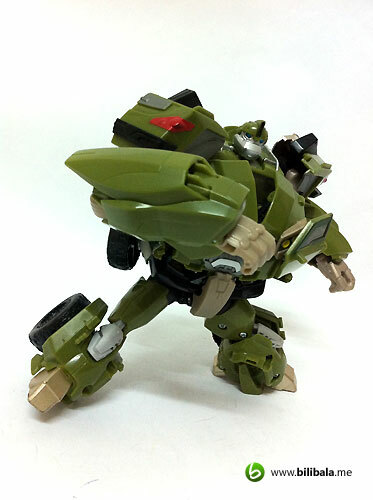 It is very intriguing to transform him from a small alt mode into a bulky robot mode. And definitely, the initial transformation needs a bit of time to mingle around. 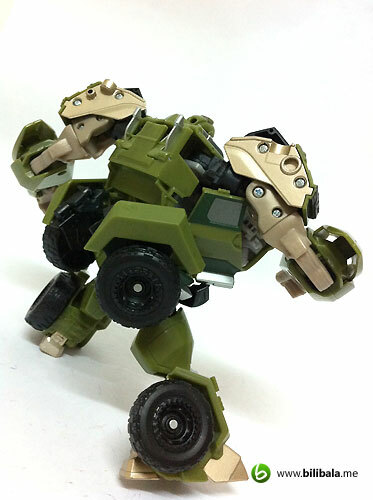 Most of the transformation sequences are constituted from transforming the upper body section. 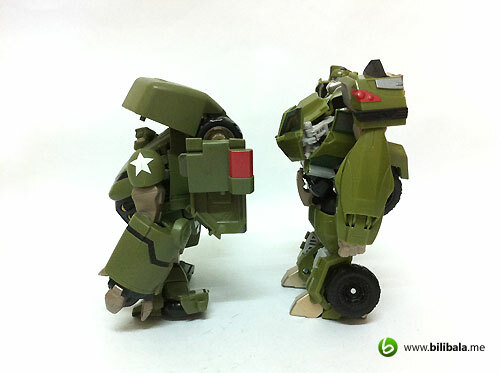 The leg section will have the more direct and straightforward transformation. 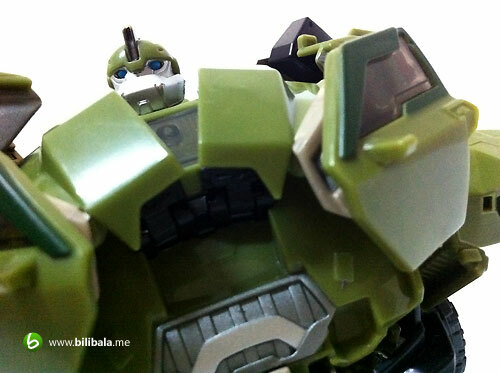 Here’s a section specially dedicated to Bulkhead. The comparison between his older self and his newer self. 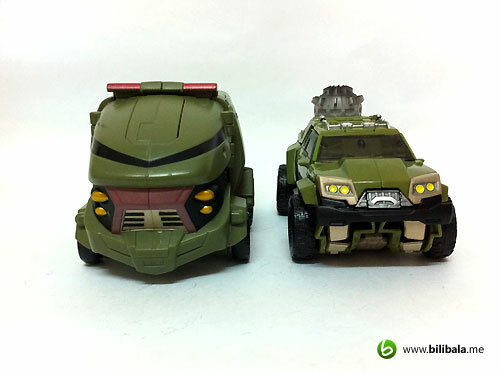 Apparently, the old Bulkhead’s alt mode is slightly bigger than the current one. And of course, as mention previously, the plastic quality of the Animated version is much more solid as compared to the new one. Side by side comparison. 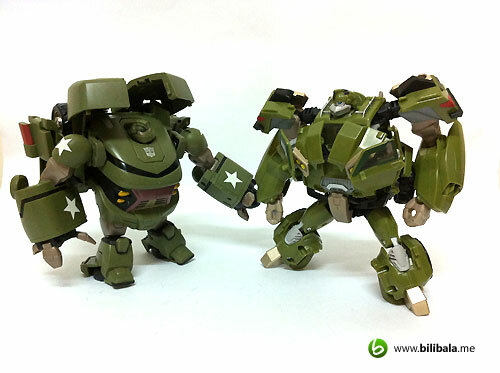 The Animated Bulkhead will have a slight taller body. 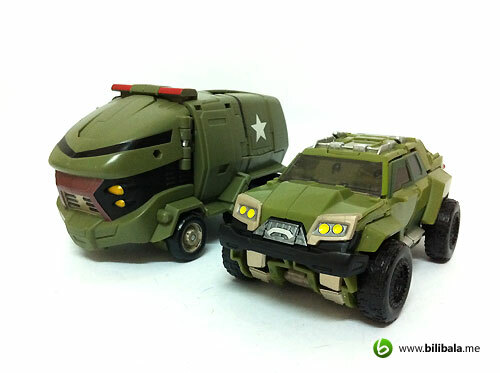 Well, despite the taller alt mode, the new robot mode is surprisingly taller than the old one. Speaking of great toy engineering! Here’s another mug shot of him. Much clearer in seeing who is the taller and more slimmer one. As comparing to his counterpart of the same voyager class, he looks slightly bigger. But they are actually the same length. 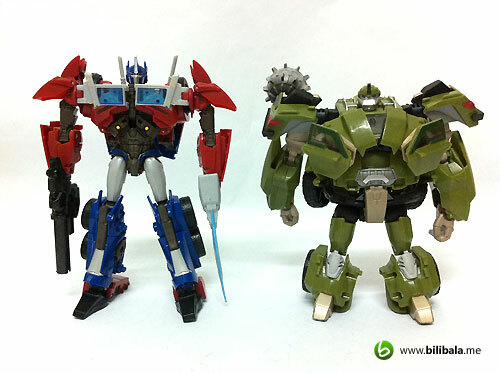 And comparing to the robot mode, Optimus Prime definitely is taller and slimmer compared to the muscular and bulky Bulkhead. This does give a great and nice size proportion. 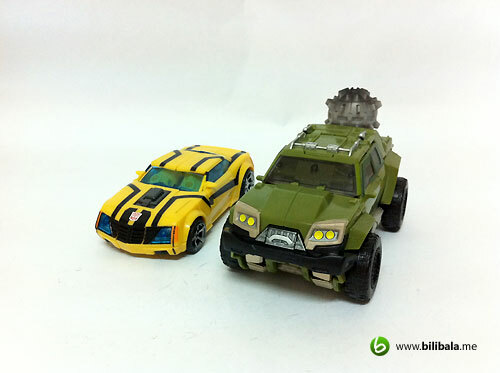 Here’s a quick comparison with one of the deluxe class, Bumblebee. See the size of them which are in proportion. And in fact, he is in scaled with Cliffjumper as well BUT of course not to the overgrown bike mode of Arcee (which however, still in scaled with the robot mode of her afterall). 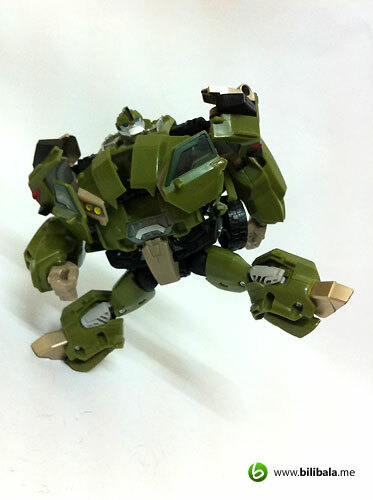 And to the robot mode, definitely the proportion you are looking for. Well, get ready for some extensive pictures of him. To be frank, he is my most favourite robot in Prime series and that’s why i took quite a number of pictures of him to showcase here. Enjoy and do tell me which is your favourite shots too! 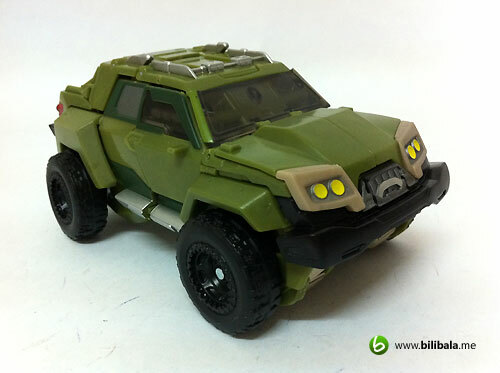 Let’s start off with the alt mode. 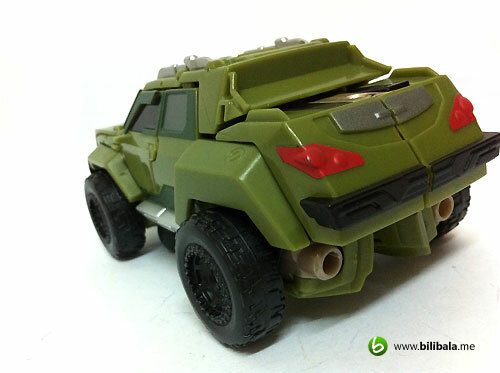 The alt mode does give a relatedness to his robot mode, being the strong, sturdy, durable and solid nature of an ATV. And in the meantime, being a bit sporty as well with double exhaust to boost up the speed! Speaking of which, does the mace become my radar/antenna? Now, let’s bring on the battle! Watch out for my hand cannon! The mace looks very light on me, but it wont be on my enemy! 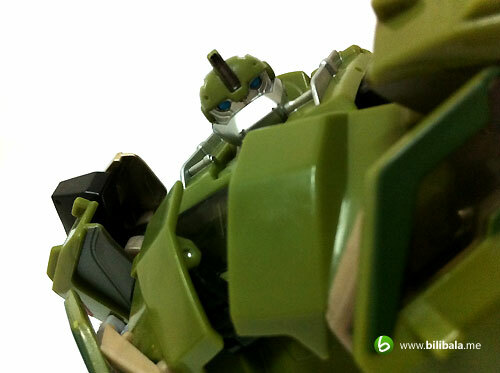 One of my favourite close up shot of Bulkhead. 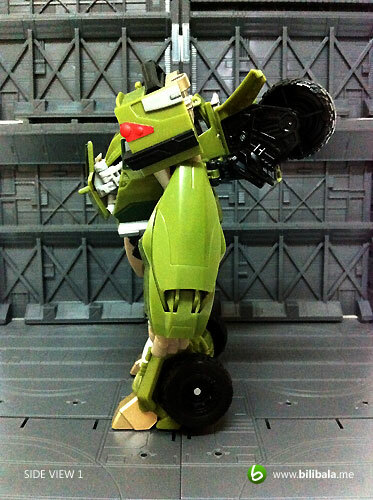 Though being fat and short, i still can do the leg kicking pose, better than any of you! Double hand cannon in action! My most favourite shot of all! I give it a rating 11/10! Love this very much! A shot from the back. Nothing much to see though. Another one of my favourite closed up shot. 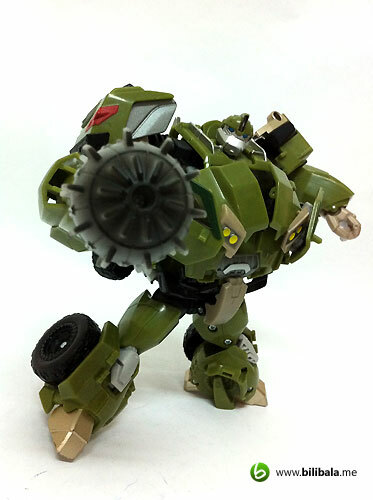 This shot gives me the solidness of Bulkhead. Shot with the older me! Similar mace, but not the same. 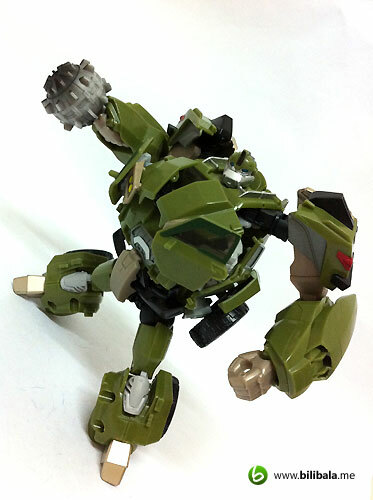 Really like how the new and improved version of Bulkhead. Despite not having the cuteness from the Animated version, the new version has his own unique character with more muscular and bulkiness body built up. Definitely my most favourite robot in Prime! 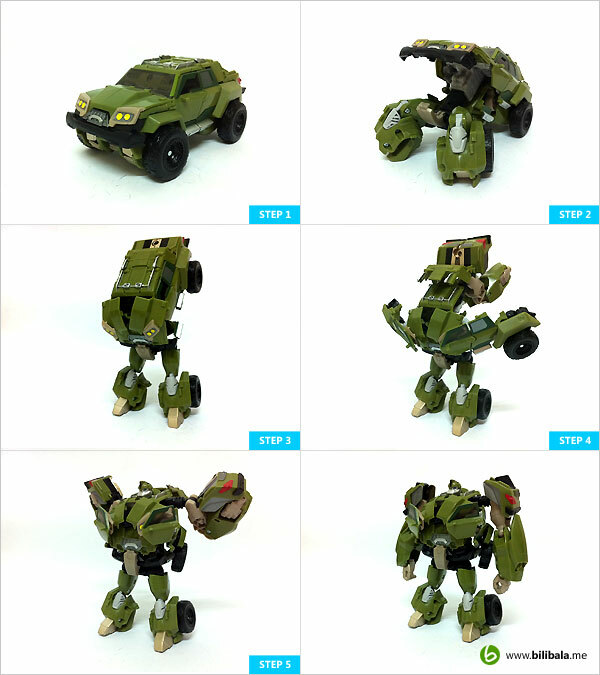 What I like – The transformation engineering is AMAZING (how it pack the whole bulky robot mode into a small ATV); great proportion with other Autobots; despite being bulky, the pose-ability is still great and very confident; great robot design! What I dislike – Missing Autobot insiginia; quality is not as solid compared to the old Animated version; certain joints doesn’t close up properly after transformation. 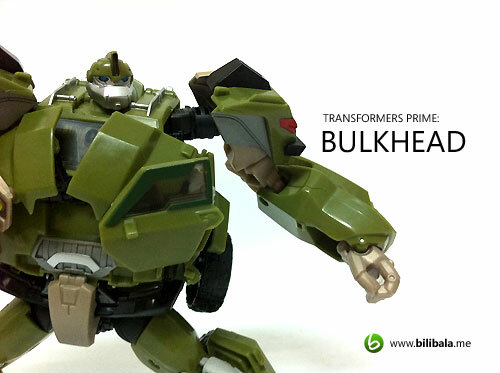 I know it's late and all, but this version of Bulkhead reminds me of a sumo wrestler ;) Nice catch, by the way. When they're out, more Prime toy reviews please! 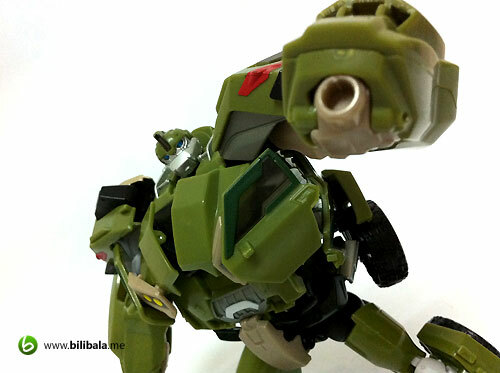 All the great shots for Bulkhead. Bravo ! 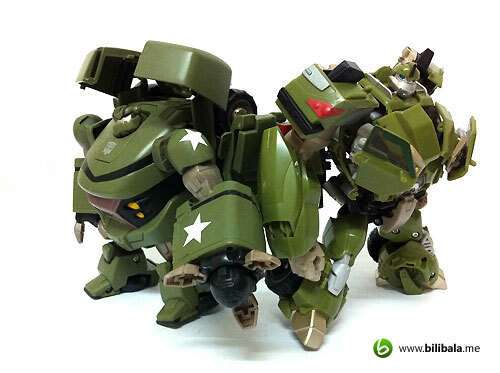 I personally feel this fat bot is having 'the big head small tail' body (Chinese saying). Despite the big top, it is still decently pose-able and possesses high show accuracy. 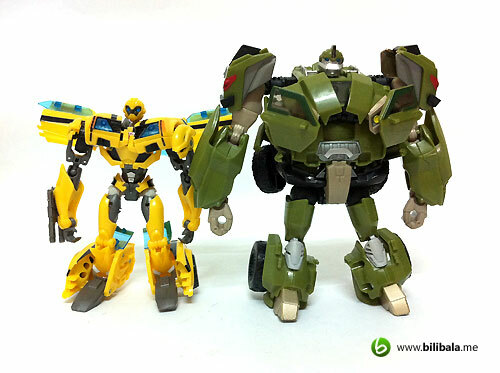 The allotted voyager class to it provides proper proportion to Bumblebee, Arcee and Cliffjumper. 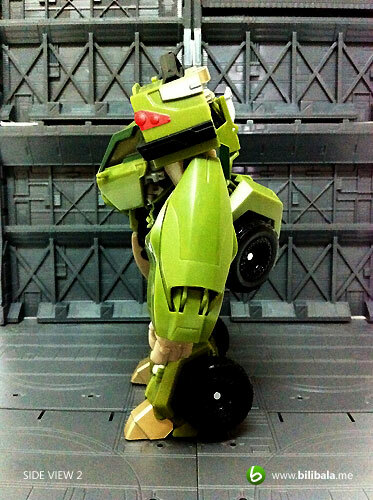 I do hope Ratchet will come in voyager class too. That would make up a great autobot team ! 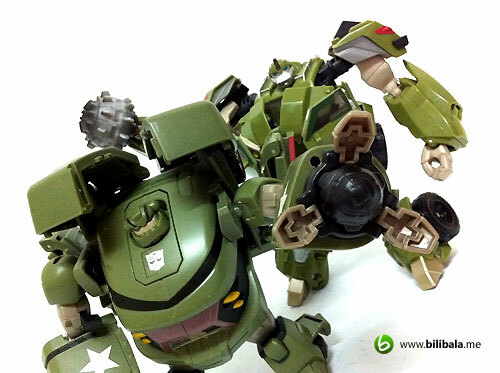 great review for bulky, francis.